"Xiaoming" Senior High School was named after the Latin original "Stella Matutina", meaning "Xiaoming Star": at the darkest moment before dawn, Xiaoming star is shining in the sky; its appearance brings hope to the world. During the long expectation of the birth of Jesus Christ, people were bound by sin, as if living in darkness. When Virgin Mary appeared in the world to help Jesus complete the work of salvation, people re-immersed in the grace of God to overcome sin. Undoubtedly, Virgin Mary brought good news and hope to the dark world. Therefore, the Church piously respected Virgin Mary as "Star of Xiaoming." The nuns of the Church of the Sacred Heart of the Virgin Mary, with the name of "Xiao Ming", hope that all Xiaoming people will learn simplicity and humility from Virgin Mary, and offer their care, attention to other people. Besides, they are expected to be considerate and able to actively help others, following the example of Xiaoming star which can not only eliminate darkness and depression, but also bring light and hope indeed. The school is located far away from the hustle and bustle of the city, with a campus tranquil and beautiful. Strolling on the campus, you will feel as if bathing in paradise. Fragrant flowers and the lush lawn all open their arms to embrace you. 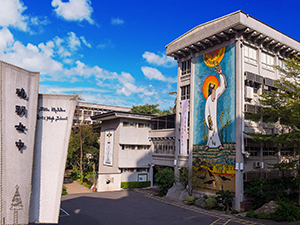 At the gate, you can see the huge fresco of “inherit the past and usher in the future,” which inspires the faculty and the students, in the faith of God, to accept the baptism of life and spread the seeds of love and wisdom. The overall major campus buildings include the Consummate Truth Building, the Consummate Perfect Building in the coconut shade, the majestic towering Consummate Beauty Building, the warm and quiet Consummate Holy Building, the cultural and artistic Consummate Purity Building, and the solemn and elegant Chih-Ying Building where many assemblies and ceremonies are held. All campus buildings were designed to provide the best learning environment for the students. The Consummate Truth Building is now under reconstruction. Many fund-raising activities have been held for the financing of the building. We are grateful for whatever you can afford to give. For the academic year of 16/17, the school held a total of 47 classes from grade 7 to grade 12 with an enrolment of 2311 students. We have a teaching staff of 166, including 5 native English-speaking teachers. Our teacher-student ratio is 1:14.